South of the West, a first year student’s Western Film took home Best First Year Film Award at the inaugural Durban AFDA year end awards on Campus last Friday. The awards ceremony was an intimate celebration of the pioneering group of first year students who enrolled in AFDA’s Durban campus at the beginning of this year. Excellence was acknowledged in the following categories: Best First Year Film, Best First Year Animation, Best Television Production, Best Song, Best Group Document Pitch, CLVA Award (student representative body) and most Dedicated Student. “All the students’ awards were nominated through the marks they received for the projects or individual work for the individual awards. The CLVA award is for the student who is on the CLVA committee who has shown the values of AFDA and voted for by the students in the council” said AFDA Durban Campus Dean, Franco Human. The keynote speaker at the Awards was AFDA co-founder and CEO, Mr Bata Passchier who congratulated the students on their difficult and enjoyable journey as the pioneering group of students at the Campus. He also went on to thank staff members at the campus along with the parents of the students by saying, “The task of an excellent teacher is to stimulate seemingly ordinary minds into unusual effort and guide them to their success, and it is no easy task. After a short journey we all sit here this morning overwhelmed with pride and I would like to congratulate the staff and students for getting this far. A special thanks and congratulations need to be extended to your parents. Without their support none of this would be possible”. In his first year project straight out of the Wild West, Nathan Rice, first time director and writer wanted to pay homage to the great Hollywood Westerns, but with a distinctly South African subtext. Our hero, played by Zwakele Majozi enters what seems to be a “whites only” bar, he asks for Whiskey. Super bad cowboy played by AFDA student Charles Matthews, confronts him and a shoot- out ensues. Our hero shoots dead the bad cowboy and his two cohorts. He again asks for Whiskey, and Whiskey comes in the door - turns out she’s the local good time girl - and they leave the bar hand in hand, watched by a bemused barman. “The film is slick, well shot, great production design and almost flawless continuity in lighting, shot selection and performance. These disciplines along with the editing, VFX and sound design have set a bench mark for first year films” said Lecturer Richard Green, Head of the Film School. Other winners on the night were Man In a Box for Best Group Pitch, Kryptoheight for Best First Year Animation, 031 Pulse for Best Television Production, Do Not Disturb for Best Stage Performance, Lauren Flockhart for Best Song, Anja Schuulst for the CLVA Award and Temara Prem for Most Dedicated Student. 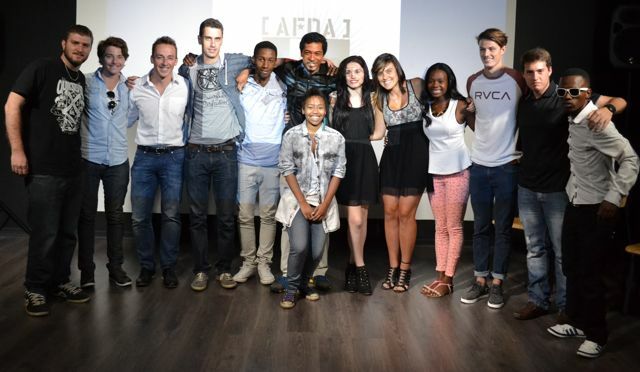 Applications and registrations for AFDA’s first year students for 2014 are open. To apply, register for enrollment or find out more information contact Milena on milenag@afda.co.za.